If you own a Motorola DROID 4 and have been wondering whether or not you would ever see the day when Android 4.0 would grace your device, wonder no more. 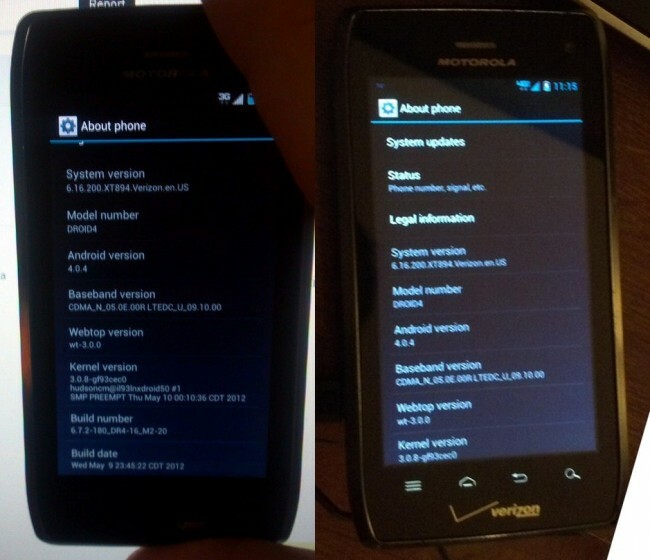 While, this isn’t quite confirmation of any official OTA, it would appear that an official test build of the MotoBlur-skinned Ice Cream Sandwich update has been spotted over on Droid Forums. Before you blow a load on yourself, keep in mind that the waters get really murky when dealing with updates of this nature. Past experiences tell us that Moto phones and leaked test builds don’t always play so nicely with one another. In fact, you could possibly find yourself stuck on the new test build, with no surefire way of returning to Gingerbread without turning your D4 into a big, fat brick. Be careful! If you have the cojones to proceed, you’ll want to head over to the original post, by Hooks405, in the source link below. Make sure to read the instructions carefully before doing anything. We’d hate to see anyone break their phone, but we won’t be held responsible if they do.